Kabuto Ni ('兜煮', is classified into appetizer), is known as Simmered Fish Head in English, and 煮鱼头 (Zhǔ yú tóu) in Chinese. It is the washoku. Sakana no Ara no Nitsuke. Fish Head, Soy Sauce, Sugar. Fish Head (Tuna, Sea Bream, Salmon), Salt, Sake , Mirin , Japanese Leek, Burdock. 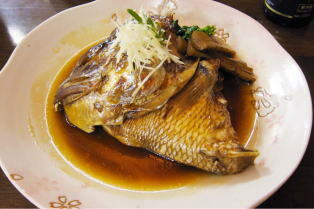 Fish head is sometimes called 'Ara' in Japanese.